Napa Valley produce inspires much of Katianna Hong’s cooking at The Charter Oak. 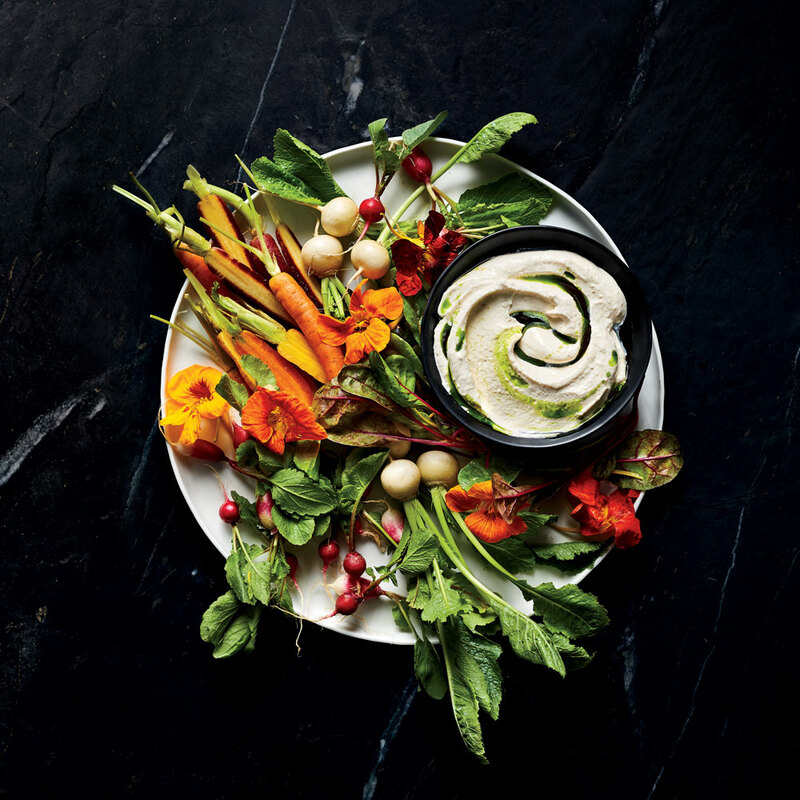 For her Crudités and Fermented Soybean Dip, she keeps it simple, pairing just-picked vegetables with a thick, tangy soy dip. This dip is the perfect way to show off whatever fresh vegetables you can get your hands on. You can find soybean paste and fermented soybeans in syrup at Korean markets or at amazon.com. Prepare an ice bath. Process chives and grapeseed oil in a blender until completely smooth and hot, about 2 minutes. Transfer to a small bowl, and place bowl in ice bath. Cool until mixture is room temperature, 10 to 15 minutes. Remove bowl from ice bath; cover and chill 8 hours or overnight. Line a fine wire-mesh strainer with cheesecloth, and place over a medium bowl. Pour chive-oil mixture into cheesecloth, and let strain slowly at room temperature, about 1 hour. Discard solids. Chill chive oil until ready to serve. Chive oil can be stored in an airtight container up to 2 days. Process soybean paste and fermented soybeans in a mini food processor until smooth, about 45 seconds. Set soybean puree aside. Stir together gelatin and 2 tablespoons cold water in a small bowl. Let stand 5 minutes. Stir together gelatin mixture and heavy cream in a small saucepan. Cook over low, stirring constantly, just until gelatin is completely dissolved, about 2 minutes. Remove from heat. Place sour cream in bowl of a stand mixer fitted with the whisk attachment. Beat on high speed until slightly thickened, about 4 minutes. With mixer running, add warm gelatin mixture in a slow, steady stream, beating until mixture is slightly aerated, about 1 minute. Cover and chill until gelatin has set, about 20 minutes. Stir soybean puree into sour cream mixture. Press mixture through a medium wire-mesh strainer over a bowl; discard solids. Stir in lemon juice. Transfer dip to a serving bowl. Drizzle with chive oil and olive oil. Serve with crudités.